Today was my first day not on All Access Boston Harbor and I was able to explore places I haven't been to as often as Spectacle or George's Island. Paula picked Liz and me from the North Quincy train stop and we began our journey to Blacks Creek. The morning started off slow but as the clock struck 11:00, two pairs of brothers showed up: Jack and Conor, Colin and Brian. It was crab count day, so of course, it turned into a (friendly) competition of who could catch the largest crab and who could capture the most crabs. Brian caught the largest crab, which measured up to 6.3 cm in length! But crabs weren't the only thing he caught from Blacks Creek. He caught a HORSESHOE CRAB! I was scared out of my pants, but finally plucked up the courage to go over to Brian and help him carry the crab. Brian and I paired up our nets to bring the monstrous creature to Paula who started an impromptu teaching lesson. We learned to tell the difference between the male and female crabs, and they turn out to be more related to spiders than spider crabs! 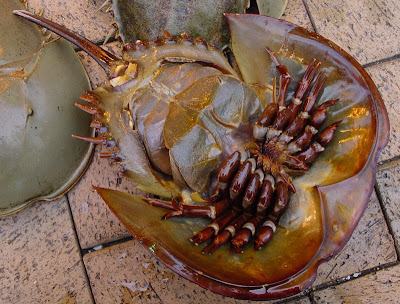 This arthropod usually lives in shallow salty ocean waters on SANDY or muddy bottoms. 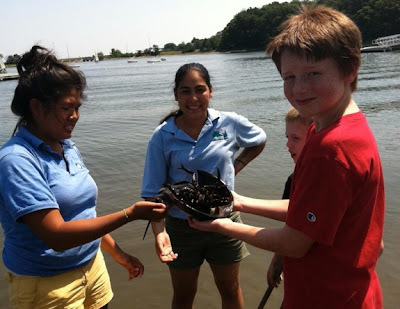 (We found out that this horseshoe crab was a she) She has 10 legs and her mouth is right in between the 5 pairs. Females grow larger than males. Although I first believed that her tail was used as protection to anyone or anything that wanted to pick it up, I learned that it is actually used to flip itself over whenever it finds itself flipped upside down. I wanted to know more about this so I decided to look it up after work. After researching more about this amazing creature, I found out that it has blue blood and are informally known as a living fossil. I can't wait to see what tomorrow is going to bring! !